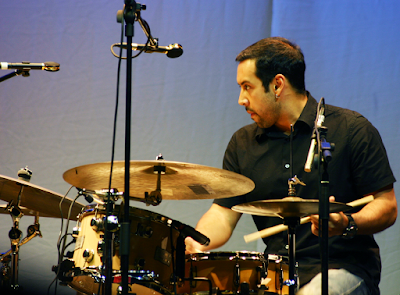 Antonio Sánchez needs no introduction as one of the world's best and most in-demand drummers, with a c.v. including most of Pat Metheny's bands since 2000. What his own band, Migration, demonstrates is that his composing, arranging and bandleading skills are by now also really extraordinary and reinforce his unique place in the pantheon of music. It's hard to believe that his debut as a leader – also called Migration – was only in 2007. The writing was inventive, it was unquestionably jazz and the format was (reasonably enough) "heads and blowing". From there to the music performed on this tour is a long compositional journey which few people would ever make, let alone in 10 years or so. Firstly, one is struck by the unhurried way in which the themes emerge, develop, unfurl and disintegrate into the next part of the epic saga. And there is indeed a large story behind the work, namely Donald Trump's policies towards migrants from South and Central America, and most especially from the country of Sánchez' birth, Mexico. The depth of Sánchez' anger and passion about this subject was obvious when he spoke, and his speech – as with all virtuous political speeches – was moving in its humanity and righteousness. The music – like the speech – was unflinching and did not shy away from the harrowing aspects of the migration it aims to represent. Consequently, there's a lot of tumult in the music, but expressed with a lithe mastery which disguised the potential awkwardness of the many changes of meter. Far from being "heads and blowing", individual solos emerged at broad intervals and were always exceptional. The move away from what anyone would call "jazz" to music freely influenced by any and every style was most obviously evinced by the addition to the band of singer Thana Alexa, and the more extensive use of EWI and electric bass in this than in former incarnations of Migration. The new album Lines in the Sand hasn't yet been released, but having recorded and toured the material the band was very much "inside" it and their affinity with the (difficult) music and Sánchez himself served also to underline his skill as a leader in assembling and maintaining such an outstanding group. Chase Baird has replaced Seamus Blake (of whose playing, unsurprisingly, one detects echoes in Baird's) and former cricketer Orlando Le Fleming – now a longtime resident of NYC – spent most of the set on bass guitar in the position formerly occupied by Matt Brewer. Doncaster-born pianist John Escreet, dazzling as ever, shimmied back and forth between the acoustic instrument and Fender Rhodes. Interestingly, Sánchez had some masking tape on the batter side of every drum (including each of three snare drums, two of them to the left of his hi-hat), giving a very different sound from the jazzy resonance of previous projects and indicative of the different, less acoustic direction of this material. The effects (especially reverb) on the kit were noticeable and the sound engineer deserved the credit Sánchez gave him. The (large) audience at the Jazz Café was treated to something very special: a working band completely on top of complex contemporary material with no obvious exact parallels, from the mind of a uniquely-placed musician whose career just keeps ascending.